Apoptosis is the tightly controlled pattern of cell death necessary for typical growth and development in multicellular organisms. Defective apoptosis can result in abnormal development and pathogenesis. Caspases cleave target proteins at specific amino acid residues during a programmed proteolytic cascade. Apoptotic signals trigger caspase activation, which involves the cleavage and subsequent rejoining of the large (p20) and small (p10) caspase domains and removal of an amino-terminal prodomain. Mammalian caspases are classified according to structure, molecular function, and substrate preference. 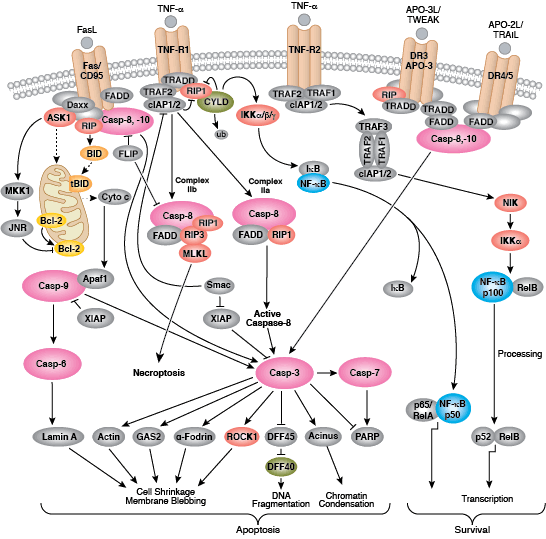 Caspases-2, -8, -9, -10, and -12 are referred to as "initiator caspases," as they are closely coupled to upstream, pro-apoptotic signals. Initiator caspases cleave and activate downstream effector or "executioner" caspases-3, -6, and -7 that modify proteins ultimately responsible for programmed cell death. Targets such as PARP and lamin A/C are cleaved by executioner caspases and serve as markers of apoptosis. Caspases can be inhibited by inhibitor of apoptosis (IAP) proteins (c-IAP1/2, XIAP, livin, survivin) that block caspase activity either through direct binding or by acting as ubiquitin ligases that target caspases for ubiquitin-mediated degradation. Interaction between IAP proteins and IAP inhibitors (Smac/Diablo) relieves IAP-mediated caspase inhibition to promote apoptosis. 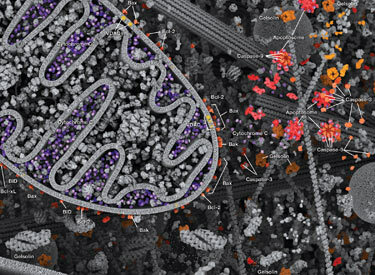 Intrinsic control of apoptosis requires activation of cytosolic caspases by mitochondrial cytochrome c release and involves regulation of mitochondrial outer membrane permeabilization by Bcl-2 family proteins. 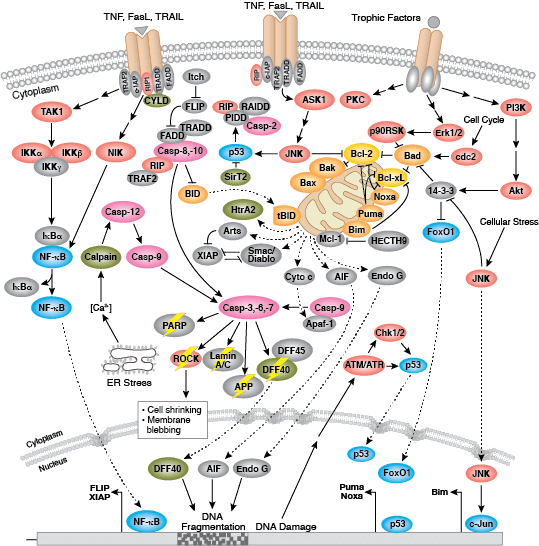 Bcl-2 proteins that promote cell death include those containing either multiple BH domains (ie, Bax, Bak) or a single BH3 sequence (Bad, Bik, Bid, Puma, Bim, Bmf, and Noxa). Prosurvival, multiple BH domain Bcl-2 proteins include Bcl-2, Bcl-xL, and Bcl-w. Pro-apoptotic Bax and Bak oligomerize at the mitochondria to alter membrane permeability and allow cytochrome c release into the cytosol. Anti-apoptotic Bcl-xL competitively binds membrane-bound Bax to promote its removal from the mitochondrial membrane. “BH3 only” proteins are essential regulators of apoptosis and promote cell death by inhibiting anti-apoptotic proteins and promoting insertion of Bax and Bak into the outer mitochondrial membrane. 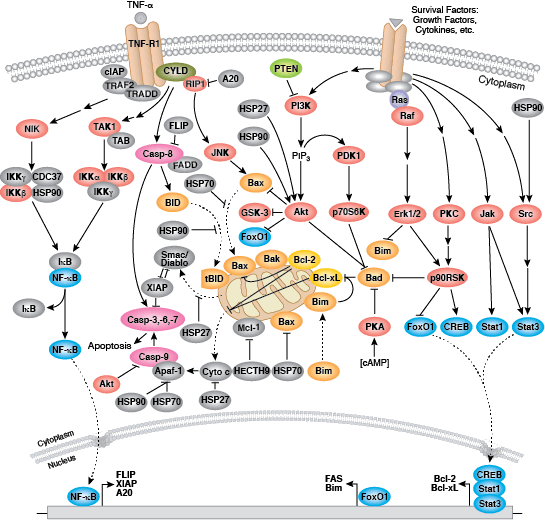 Bcl-2 family protein activity is often regulated through phosphorylation. Phosphorylation of Bad prevents interaction between Bad and anti-apoptotic Bcl-2 and Bcl-xL proteins. Pro-apoptotic Bim phosphorylation results in ubiquitin-mediated degradation of Bim and decreased inhibition of anti-apoptotic Bcl-2 and Bcl-xL proteins. Phosphorylation of Bid in response to DNA damage prevents its activation and promotes DNA repair and cell survival pathways. 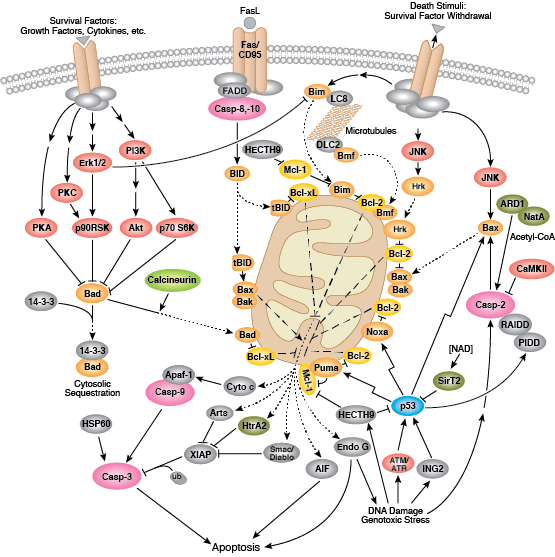 The extrinsic pathway for apoptosis can be induced through the activation of death receptors including Fas, TNFαR, DR3, DR4, and DR5 by their respective ligands. Death receptor ligands characteristically initiate signaling via receptor oligomerization, which in turn results in the recruitment of specialized adaptor proteins and activation of caspase cascades. Binding of FasL recruits initiator caspase-8 via the adaptor protein FADD. Activated caspase-8 stimulates apoptosis via 2 parallel cascades: it can directly cleave and activate caspase-3, or it can cleave Bid, a pro-apoptotic Bcl-2 family protein. Truncated Bid (tBid) translocates to mitochondria, inducing cytochrome c release, which sequentially activates caspase-9 and -3.